Welcome to the new exciting, delicious, finger-licking treats that the well known brand “Zulu Destinations” has to offer. We have a wide range of platters to suit your every requirement. From breakfast platters through to the late night cheese treat after a long day crunching numbers in the office. It’s a well known fact that platters always set the mood, whether it’s in the corporate board meetings or at a family gathering. 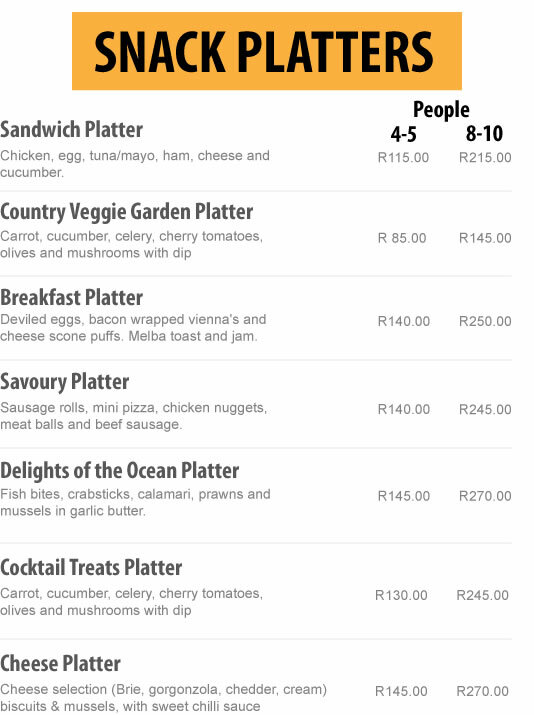 We cater for all occasions and can even tailor make your platter to suit you. So when you phone in don’t be shy to ask our friendly staff to make up a platter of your personal favourites. When making up your platters we only use the finest ingredients to ensure top quality platters leave our kitchens. We strive and exceed at ensuring your health comes first, we do this by making sure that everything we offer to our clients is at the pinnacle of cleanliness. We know that the last thing to remember in our busy schedules is to fetch the food, so we offer a delivery service for your platters right up to your door. It’s a free service up to 20km from Durban’s CBD (in all directions) with a small fee of R50 for any distance that exceeds 20km. Please take a minute to review our standard platters on offer, and then remember us for the next big occasion.